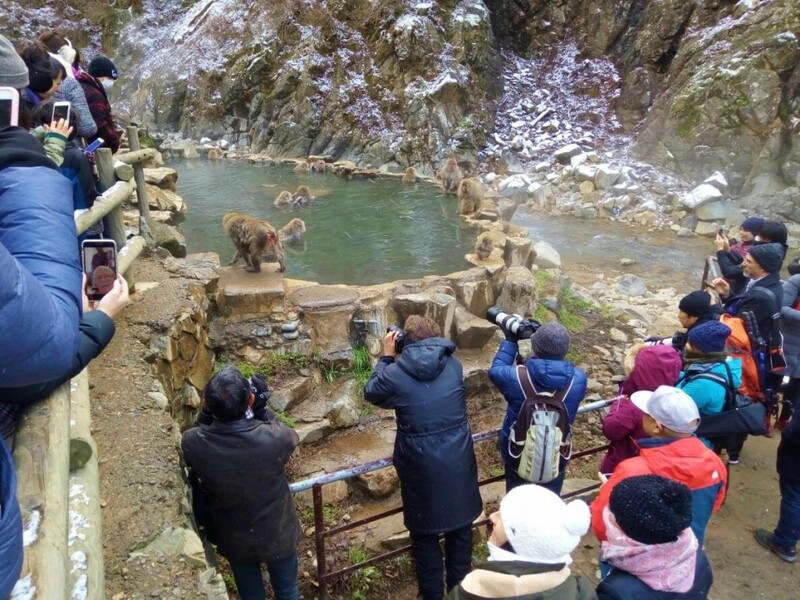 The snow has finally arrived in the monkey park and with it, the monkeys are straight back into onsen as they welcome another cold season and many new visitors this winter! The photo above was taken this morning at the entrance to the park. It’s the first really decent snow of the winter and as the white stuff continues to fall in the nearby mountains and ski resorts, it appears that the 2018/19 snow season has finally arrived. 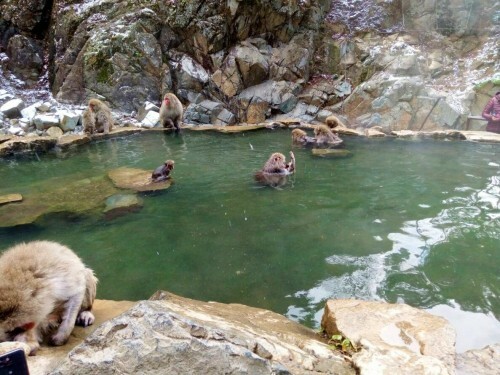 With the landscape now turning white and the temperature dropping, the monkeys know the the best course of action is to jump into their ‘onsen’ (hot spring) and bathe the winter days away! It is now known that the monkeys enjoy soaking in the thermal waters not just to survive the cold winter but also as a form of relaxation. Research has shown the female monkeys which are pregnant, or attempting to get pregnant, will spend the longest time bathing. 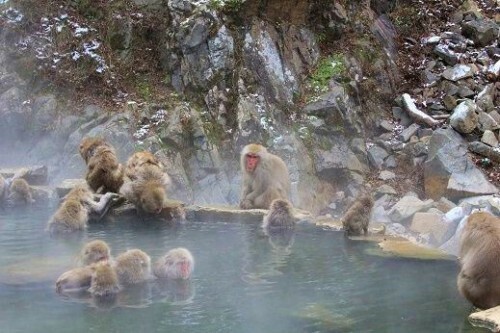 Sitting in the hot spring for long periods releases a hormone which relaxes them and aids with the pregnancy. They are without doubt, smart creatures who have adapted extremely well to the harsh conditions of winter. Visiting the park in winter is one of the most popular experiences in Nagano and one which draws the crowd. As you can see from the photos above, the snow has only just started to fall but from now on, you can expect it to become more frequent and heavy. It is therefore a good time to discuss how to prepare for you visit to the park during winter. As winter progresses, the trail leading to the park and park itself will be affected by snow and ice. Conditions underfoot can become a little dangerous and with the very cold temperatures experienced in the park – which can drop as low as -5°C to -10°C – please ensure you are dressed with appropriately warm clothing and sturdy footwear. Access to the park is along a 1.6km (1 mile) trail, which outside of winter is pleasant 20 to 25 minute stroll. Perhaps at it’s most beautiful in winter, it will take approximately 30 to 40 minutes to walk and can also be somewhat treacherous and slippery so please ensure you are prepared and take your time on the trail. 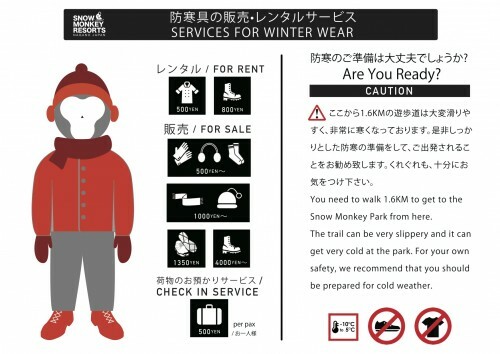 If you don’t have the necessary clothing and footwear for the park, don’t panic. 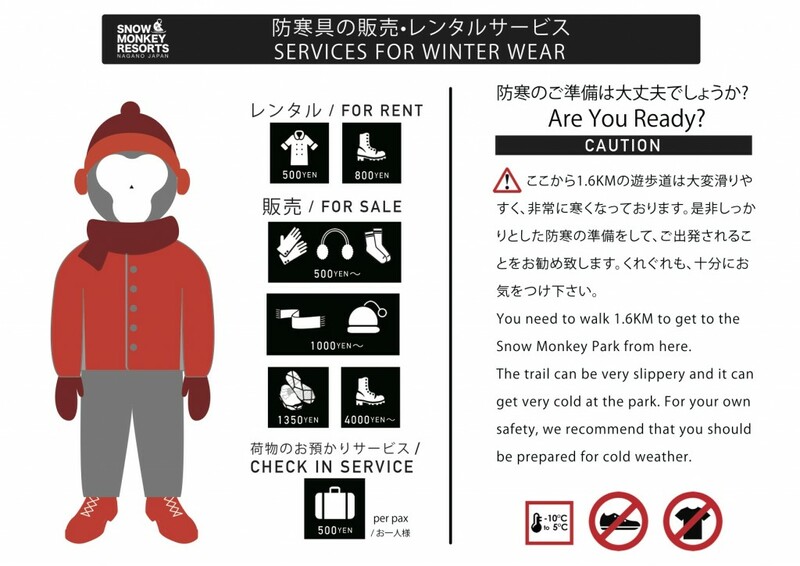 The Snow Monkey Resorts Info & Gift Shop is open everyday through winter and has snowboots and jackets for rent, with cramp-ons (metal spikes that attach to the underside of your boots) for sale along, with winter clothing such as gloves, mufflers, and beanies. One of the best ways to enjoy the park through winter, and turn your visit into a truly memorable experience, is by joining our No.1 rated tours. 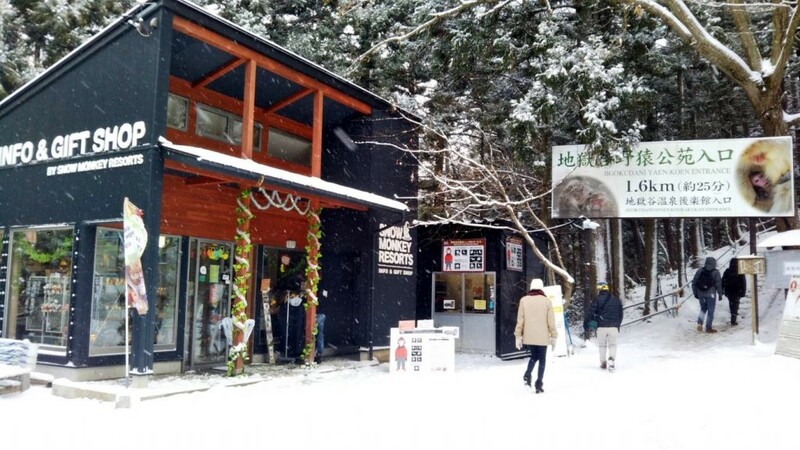 Operating daily we offer group tours starting in both Nagano City and Hakuba. 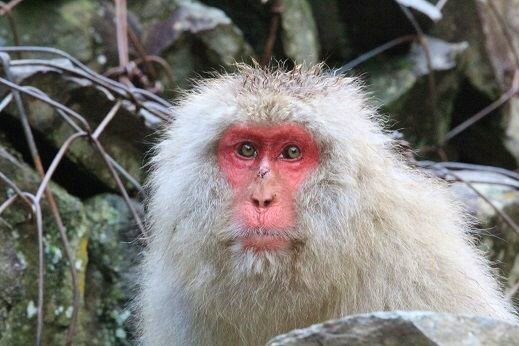 Our 1-Day Snow Monkeys, Zenko-ji Temple & Sake Tour combines a visit to the park with lunch and afternoon visit to Zenko-ji Temple and sake tasting in Nagano City; and for visitors based in Hakuba, our 1-Day Snow Monkey Winter Tour from Hakuba includes at visit to the monkeys with afternoon exploration of Matsumoto Castle and quick stop at Daisekkei Sake Brewery before returning to Hakuba. For guests wanting to combine their visit to the park with an afternoon of enjoying the powder at Japan’s largest ski resort, Shiga Kogen, our 1-Day Snow Monkeys & Snow Fun Tour is popular with adults and kids alike, and suited to guests of all ages who just want to have fun! We are very happy that the snow is now falling in the monkey park and we look forward to seeing you here this winter!